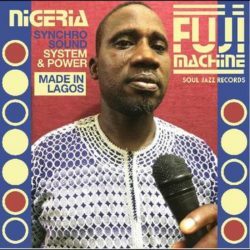 Syncho Sound System & Power features the music of Nigeria Fuji Machine, which includes some of the country’s finest Fuji master drummers and singers, and is newly recorded by Soul Jazz Records in Lagos, Nigeria. Fuji is the heavily percussive and improvisational style of Nigerian popular music, at once modern and yet deeply rooted in the traditional Islamic Yoruba culture of Nigeria, a hi-energy street music which evolved out of the Islamic celebration of Ramadan. Here on this album Nigeria Fuji Machine’s striking and powerful lead vocalist Taofik Yemi Fagbenro soars above a wild and energetic backdrop of polyrhythms played on traditional talking drums, trap drums, electronic and street percussion to create a powerful wall of intense sound. By the early 1970s this music had crossed-over into popular Nigerian culture where it came to be known as Fuji, first made popular by the artist Alhaji Sikiru Ayinde Barrister. In the 1970s and 1980s three Nigerian artists King Sunny Ad, Chief Ebonezer Obey and Fela Kuti all secured international major record deals bringing popularity to the Nigerian musical styles of Juju (Ad and Obey) and Afro-Beat (Fela Kuti’s unique mixture of highlife, funk and jazz) abroad, but in the process ignoring much of Nigeria’s rich musical landscape. Fuji is, alongside Highlife, Juju, Afro-Beat, Sakara, Afro-Reggae, Waka, Igbo rap, Apala and numerous others one of these central styles of Nigerian music. The singer Barrister described the music as follows: Fuji music is a combination of music consisting of Sakara, Apala, Juju, Aro, Afro, Gudugudu, and possibly Highlife. Today it remains a popular music with deep Islamic roots which continues to modernise and Nigeria Fuji Machine’s Syncho Sound System & Power is a powerful and intense musical experience.